Based on an old Russian folk tale, The Great Big Enormous Turnip is about a little old man (grumpy old geezer!) and a little old woman (nagging old bat!) who hate the sight of each other! Then one day, the little old man grows the biggest turnip in the world and the two set about trying to pull it out of the ground. Hilarity ensues as they, with the help of the audience, learn to work together. With aspects of mime, mask, Commedia del’ Arte and warped imagination, this tale will take audiences into the depths of the deep, dark woods and back! Directed by Peter Court and Bryan Hiles, the show is performed by Hiles and Clare Mortimer. There will be a short workshop after the show, where the audience will learn to use their imagination to create a story from whatever they can. The focus is on expanding one’s imagination and will be run by the performers at no extra cost! 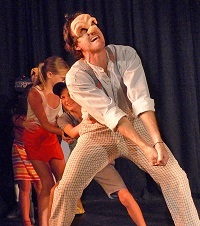 The Great Big Enormous Turnip has performances at 11h00 at Rhumbelow Theatre from October 4 to 8. Suitable for kids aged 3 to 300, the show runs for 45 minutes. Snacks and juices will be on sale. Tickets R70 are limited so booking is advised at Computicket or phone Ailsa on 083 250 2690.